Too many passwords to remember? Don't trust Internet Explorer or Firefox to store them securely? You might be interested in trying out Clipperz, which stores your passwords, logins, and other confidential information securely online. The most powerful way to use the service is to create "direct logins" so you can access any online service requiring an account with one click of a mouse. Clipperz stores login information on "cards", which you create by clicking the Clipperz bookmarklet when you are on the login page of a site. You'll receive some code that you have to paste into Clipperz, and you will be prompted to enter your login information. The video explains the whole process more clearly. Once that's done, you can get one-click access to any site you desire. 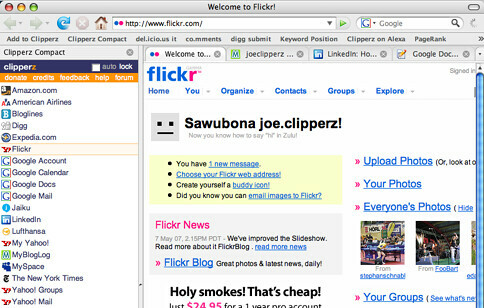 You can also integrate Clipperz directly into your browser if you're using Firefox or Opera. The compact version can be accessed as a sidebar in your browser. Just wanted to let you know about PassPack. Our tool for auto-login is a little different. You push a button while you browse - no need to click through from your account, or the sidebar. There's no plugin or software to install, just a bookmarklet that you drag onto your toolbar. More info on 1 Click login here. PassPack is free and supports import, export, backups and restore. We've also defined a unique anti-phishing mechanism. I'd love for you to try it out and let me know what you think - we thrive on user feedback.